The GLL Sport Foundation is an organisation operated by Charitable Social Enterprise GLL to support talented athletes across the UK. To support young people with athletic talent to achieve their full sporting potential by reducing the financial burden of training and competition costs. Access to physio and injury rehab support, and financial awards up to the value of £1,250. 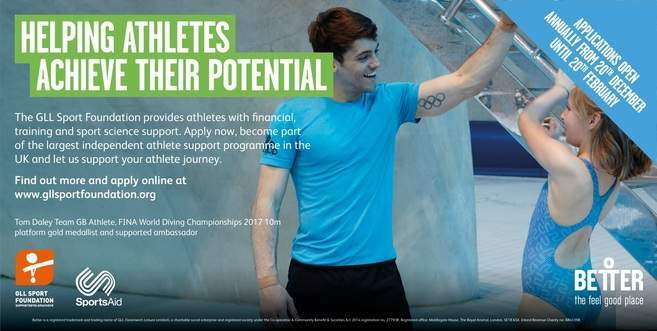 Across the UK it is projected that 3000 athletes will be supported in 2018; it will mark a special milestone for the UK’s largest independent athlete support programme as the programme turns ten years, over which period it will have provided sixteen thousand athlete awards at a value of £9million. Since the programme was launched in 2008 at the House of Commons the programme has been under the Patronage of one of GBs greatest athletes Sally Gunnell OBE, who today still remains the only athlete to hold consecutive Olympic, World and Commonwealth titles. Sally explained “When I was first introduced to the GLL Sport Foundation in 2007 and the opportunity to come on board as Patron was offered to me it was a simple yes as achieving peak sport performance as an athlete and inspiring and supporting athletes to achieve their goals have been key drivers for me through my life; so there was an obvious direct synergy”. “When we launched the programme in 2008 at the House of Commons I was positive with regards to the impact we could make to athletes across London, this same position is true today but to be able to do this across the UK where we are today supporting athletes across seventy five parts of UK including areas in England, Northern Ireland and Wales, is testament to the programme that GLL created”. “I am proud to be Patron and with GLL at the helm of this programme I know the Foundation will deliver equally positive results into the years ahead; and play a greater role in the sporting pathway with centralised sport funding being squeezed further, and most importantly impact thousands of athletes sporting journeys which in turn will positively impact their local communities”. Peter Bundey Chair of the Foundation further highlighted the network the programme works within “I would like to thank all councils; sponsors and partners to the Foundation over the length of the programme, your commitment has contributed to its success greatly”. “Finally; I would like to thank all the athletes you have delivered such phenomenal sporting successes and inspired future generations of athletes to achieve their goals and our wider communities to be more physically active. We look forward to supporting you and future generations of athletes for years to come”.